How can SMEs in Europe be encouraged to promote sustainable business? The Go Green Europe study aimed at sharing the knowledge and experience of successful approaches for supporting Small to Medium Enterprises (SMEs) to identify and implement green business measures, in harmony with EU policies such as the EU 2020 Strategy and the European Economic Recovery Plan of November 2008. Go Green Europe focused on how SMEs can be encouraged to invest time and resources in environmental efficiency improvement measures and can be best supported in doing so. The study had three main objectives; the first to research good practices and identify demonstration projects which illustrated successful means of improving the environmental performance of SMEs, with a particular focus on existing good practices in the four partner areas the four partner areas (South West London, Zaragoza, South Denmark, Sicily); the second, to exchange experience and knowledge about good practices in greening the labour market between different social partners at various levels across the European Union; and thirdly, to disseminate these findings to policy makers and other stakeholders at a local, regional, national and transnational scale. This final objective aimed to raise awareness and understanding of different means of greening the labour market among key national policy makers. This was to be done through direct engagement and via a research element of the project to provide policy makers and planners with concrete examples of what has worked in different contexts, helping towards the design of future policies and programmes. According to the Go Green Europe research, SMEs across Europe have been undertaking a wide range of measures to improve their environmental performance, motivated by factors including a desire to reduce costs, increase competitiveness, adhere to company values and corporate social responsibility, strengthen marketing and publicity campaigns, carry out behavior changes and technological improvements. The level of support received by SMEs varies both within and between the partner countries, with some companies benefitting from professional expertise or financial assistance, and others making changes independently of broader framework. The studies of the four partner countries found that Denmark delivered the most advanced environmental support to businesses, coordinated through SME membership of regional and national green networks. The effectiveness of these networks is reinforced by strong political commitment and ambitious environmental targets which incentivise businesses to improve their performance. Environmental support is well developed in the UK, with national advisory bodies and certification schemes available to SMEs alongside a range of local support organisations. Strong environmental targets and legislation encourage SMEs to improve their performance; however a greater level of coordination between support organisations would increase the effectiveness of delivery. Spain and Italy are integrating environmental awareness into existing support for SMEs, and have made significant progress in promoting environmental responsibility to businesses. These Member States can benefit from European experience by creating green networks, coordinating support at the national level, and developing financial subsidies for environmental investments by SMEs. Moreover, the study underlined how environmental support for SMEs needs to exist on a range of scales, to ensure that all businesses can access the help and guidance they need. Local outreach programmes are a valuable way to initiate environmental improvements in SMEs. Business support should be flexible, tailored and respond to the varied nature of SMEs. Support should include financial, technical and holistic measures. Research report on SMEs in specific regional locations from each country; Survey of businesses to identify approaches to improving low environmental impact performance; Study visits to showcase examples of best practice; 4 country reports-focus on existing good practice and Overarching report. 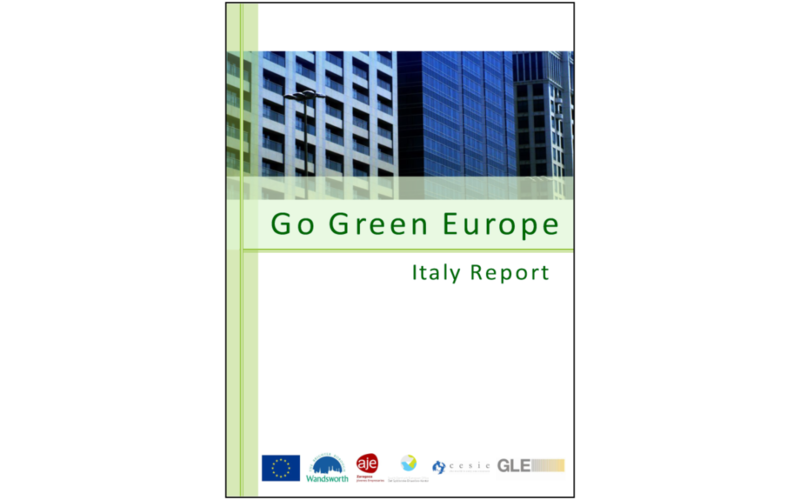 As part of the series of research reports undertaken by Go Green Europe, an Overarching report was produced, analysing good practice from all four partner countries in the context of European environmental and economic policy. Within the report, comparisons are drawn between countries, measuring successful approaches to greening SMEs and identifying effective support mechanisms in each country. The report draws on specific examples as well as outlining the environmental and economic backdrop of each country.